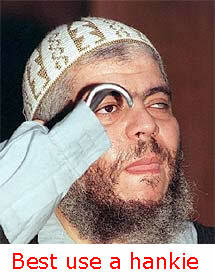 ABU Hamza, one-eyed, no-handed purple-faced people eater is to go on tour. Can he crack America? Radical Muslim cleric Abu Hamza al-Masri has been refused leave to appeal to the House of Lords against his extradition to the US. As the Daily Sport out it back then:“HAMZA CROSS THE WATER”? US prosecutors want the 50-year-old to face trial on charges which include providing support to al-Qaeda. With Hamza gone, who will be the gurning face of UK Muslim extremism. How long until we miss the wire-haired loon – our wire-haired loon? The Egypt-born preacher is currently serving a seven-year jail term in the UK for inciting murder and race hate. Situations vacant: Freelance terror consultant. We’re stumped. BBC correspondent Andy Tighe said his lawyers are now likely to take the case to the European Court of Human Rights. Our loss is the Americab labour market’s gain. Who volunteers for toilet roll duty..?